MSV has turned five, my friends. Thanks ever so much for being here. To recognize the occasion, I'll just pause to mention that this blog remains a labor of love. There are no ads here. I come back week after week, driven by the deeply held beliefs that cooking tasty food for yourself has tremendous value and that many of us can thrive without centering our diets around exploiting creatures that can and do suffer. I can only hope I've helped some other people come to the same conclusion, even if only for one meal. Five years—more than 250 weeks—of trying to accomplish that very thing feels worthy of light celebration. So! Let's toast to all those chickpeas gone by, shall we? And since we have a milestone on our hands, let's toast with something extra rich—namely, sipping caramel. 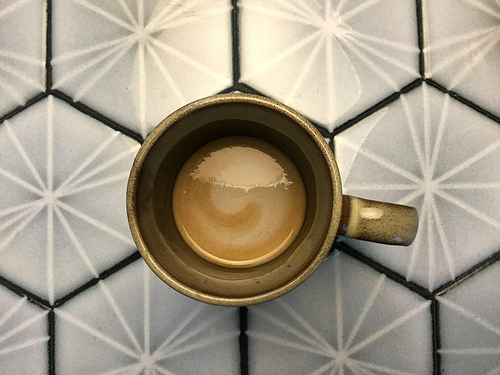 This is a simple and extraordinarily satisfying adaptation of the hot sipping caramel recipe from Anu Apte via Imbibe. I started with that sweet, decadent template and started loading in flavor accents. You'll use coconut milk with its dreamy richness in lieu of the dairy products used in that recipe. Coconut isn't the first thing you'll taste in the drink, though its flavor does come through, and if there was any doubt that it plays fabulously well with the toasted notes in caramel, worry no more. In fact, I'd argue that even if you consume dairy products, I suspect you'd be better served by making this switch. That leaves nothing to tinker with but the booze. The original recipe calls for calvados, which is probably delightful, but felt a little on the nose for my current mood. To make the whole thing a little more obviously complex, in goes a jigger of Branca Menta. (If you aren't familiar, it's a bitter herbal liqueur with a decided sweet mint character—far more approachable than most amari but far more complex than creme de menthe.) Then to really gild the lily, you'll add a little dark rum to your whipped coconut cream garnish to loosen it a bit and complement the lighter sugar and mint flavors. That may sound like a lot, but it goes down easy (and pleasingly boozy). When the weather finally turns cool, you know what to do. Warm 3/4 cup coconut milk over low heat in a small pot. Meanwhile, heat sugar in another pot over medium heat, stirring very frequently, until melted and deeply golden, about 7 minutes. (Be very careful not to let either pot become too hot—if either begins to boil, you'll end up with hard candy stuck to your pot instead of silky caramel. The coconut milk should only be warmed, and if the sugar starts getting hot, reduce heat to avoid boiling.) Stir warmed coconut milk into melted sugar along with coconut oil and salt. When the caramel sauce is ready, add remaining 1/2 cup coconut milk along with soy milk over medium heat. Stir to combine. Add 1 1/2 oz Branca Menta each to four mugs. Continue to warm the caramel mixture, stirring very frequently, until heated to your liking. Divide among mugs and stir to combine. Garnish each with one tablespoon rum-whipped coconut cream and serve at once. Note: caramel sauce can be made days in advance and chilled in the refrigerator until ready to use. To serve, warm chilled sauce with milks until the mixture is silky and uniform and proceed with recipe as written. Scoop firm cream off the top of the can of chilled coconut milk and add to the bowl of a stand mixer. Add sugar and rum and whip with the whisk attachment until fluffy.